Two artists, two different media, two separate perspectives – one beautifully balanced aesthetic experience. Both artists share a masterful command of their respective media to project radiance and light onto flat white surfaces. The results are breathtaking visual images that transport the viewer into another reality transforming their experience with nature and light. It’s extraordinary how both artists complement each other. 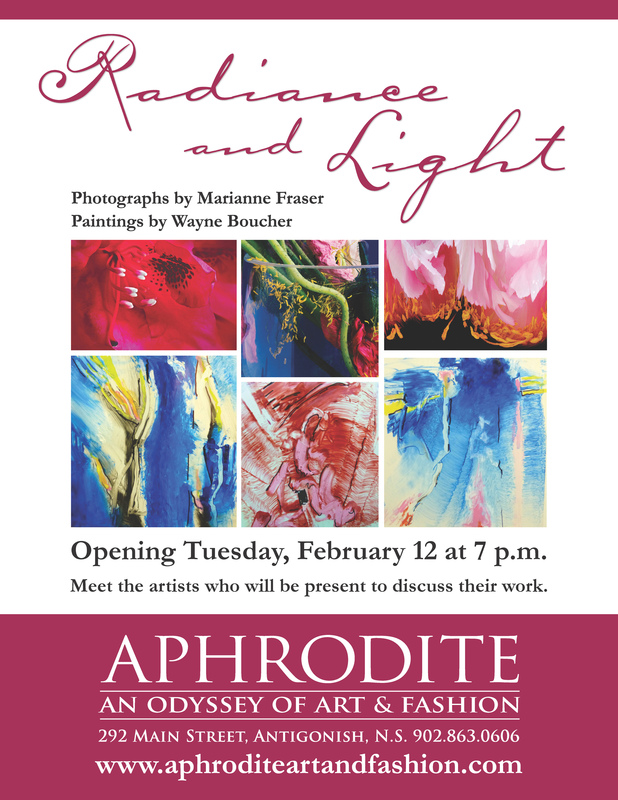 On February 12 at 7 p.m. you will have a chance to meet the artists and enjoy an experience that will both educate and inspire. At Aphrodite we believe in the goodness of the creative spirit that manifests itself in many forms. Design is a vital creative output that shapes our entire lives. While we celebrate the importance of fine art we also recognize the amazing work of independent fashion designers whose work we select for our boutique. We believe that an evening wouldn’t be complete without a mini fashion show that introduces some of the Spring 2013 collections. While winter rages spring is just around the corner. We have designed the Love in the Spring theme to walk alongside Valentine’s Day – but after February 14 we’ll just keep on moving forward with wonderful in-store surprises and events. The 7 Virtues Fragrance event on February 6 launches Love in the Spring. The Radiance and Light art exhibit takes it to the next level and everything we have chosen for you at the store will just continue to delight you. We look forward to making you happy as spring draws near. Read it all – LOVED the new posting and poetry! I’m so glad you’re following our posts and even happier that you like them! How long will the exposition last? I wish I was there basking in the love and warmth of Aphrodite. You are giving your customers such a wonderful experience when they walk through your door! Best of luck with “Love in the Spring” I’ll be thinking of you over here in Ontario!